Riley Blake Designs "Medium Dots" by Riley Blake Designs. 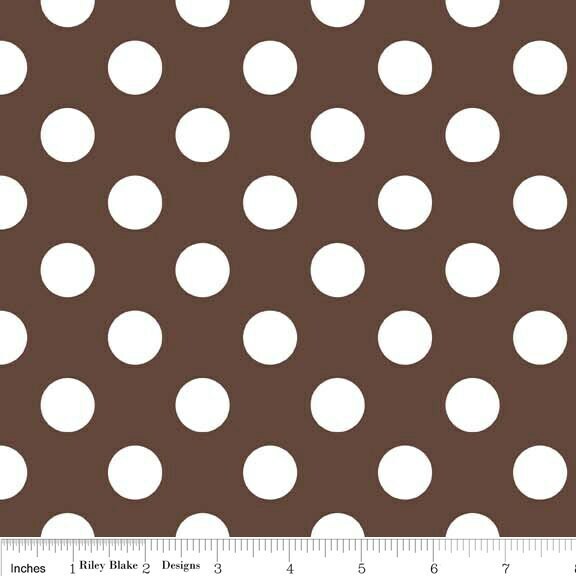 100% cotton, pattern C360-90 Brown. Pattern measures 3/4" in diameter. This will be backing for my baby quilts. Also ordered brown in swiss dot because it is a match to this brown. Both are quality fabrics and will be great in my quilts! This fabric shipped promptly, arrived safely and was what I ordered. Unfortunately, it was not what I wanted for my current project but will be added to my extensive stash and used later in another project to be determined. Thank you. This fabric makes beautiful pants for infants and girls! Thank you so much...the fabric is exactly as pictured and described and very fast shipping. I will definitely be back again! !